We have witnessed something amazing in recent years: people have begun to value content marketing and invest in. I mean really value it. This is clearly reflected by the increase of the cost of copywriting services and by the prevalence of good content. I’m so happy to see that people have moved away from spammy, keyword-stuffed articles and have started to invest in content that is actually valuable to their readers and viewers. However, I know that there still are skeptics out there. People who’d rather spend their marketing dollars on PPC ads or old-school SEO. Before we dig into the content marketing stats, I want to clear up one thing: You don’t need to make a separation between content marketing and SEO. They work best together, like a perfectly balanced peanut butter and jelly sandwich. The same goes for social media. Everything you write or produce and then set free into the world to capture leads or convert existing ones is content marketing. From the SEO-friendly blog post to the Instagram hashtag you spent hours researching, all these things are content marketing tactics. The short theoretical interlude is over; let’s take a look at some of the stats that make B2B and B2C companies invest in content marketing. 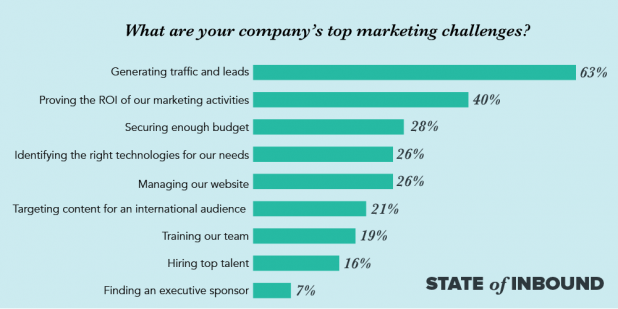 Generating leads and traffic is the top marketing challenge for businesses, according to HubSpot. And now for the good news: content marketing can generate three times more leads than traditional outbound methods and cost 62 percent less. Talk about a win-win situation. Eleven percent of the Internet population now uses ad blocking software. In absolute numbers, that’s well over 615 million devices that you can’t reach with ads. And, really, can you blame these people? We see approximately 4,000 ads per day which has led to something marketers call “advertising blindness.” Briefly put, our brains don’t even register the message on the annoying pop-up or the billboard we pass every day on our way home. We don’t even acknowledge their presence. While it’s hard to quantify exactly how many people you “lose” to advertising blindness, you should keep this concept in mind next time you plan to buy ad space on a website “with 500,000 visitors every single day.” Some will be lost to ad blockers, other will simply ignore your ads. While it’s true that blog posts usually have a limited life span, evergreen articles are like wine: the more they age, the better they become for your organic traffic. One in 10 blog posts will become compounding, which means that organic search increases their traffic over time. Consequently, compounding blog posts can generate up to 38 percent of a website’s traffic. As proven by countless studies and reports, blogging is a goldmine for both organic traffic and leads. If you’re a regular on SiteProNews, you must already know that I am strongly against vanity metrics, aka meaningless traffic that doesn’t translate into cold, hard cash. I have convinced my fair share of copywriting clients to ditch their old school SEO tactics, maybe even lose some of the traffic, but gain actual money instead. Through authority content that is both SEO and human-friendly, meaning it provides actual value for potential customers, helping them move forward in their buyer journey. Aside from my agency’s track record of success in this field, I also used the following stat to convince them. Companies that blog more than 16 times per month generate 4.5 times more leads than those that only blog zero to four times per month. In 2016, nearly 90 percent of B2B companies were using content marketing. In 2017, this number grew. Even more, during the same year, 75 percent of companies increased their content marketing budget and 43 percent added extra staff members to their content marketing departments. Forty-seven percent of B2B buyers consume three to five pieces of content before even speaking to a sales rep. This alone should tell you how much pull the right content can have. Despite the data privacy craze and people intensely hating spam, they are willing to share their data with you in exchange for valuable, informative content. White papers, eBooks and webinars are considered the most valuable types of content by users – based on their willingness to share information in exchange for them. Sixty percent of people seek out a product after reading a piece of content about it. Case in point: I have received tons of inquiries from people who read my articles here on SiteProNews or on other websites where I guest blog. They liked what they read, so they wanted to hire my agency to create content for them or manage their social media accounts. This is another piece of evidence that supports user savviness: People didn’t need to see ads saying we are the best at what we do. We demonstrated our expertise through valuable content —something that can’t be done with a cheap banner. According to the same study cited above, 70 percent of people prefer to hear about a company from an article than from an ad. Seventy percent of Internet users read blogs. Couple this with another interesting stat: 79 percent of online shoppers spend 50 percent of their shopping time doing online research. This correlation is so incredibly powerful! In fact, it reveals just how much content marketing can do. It can be persuasive without being pushy like a ’70s car salesman. Yes, content marketing works. Scratch that. It works wonders. But here’s the catch, (yes, there’s always a catch): you have to be consistent and patient. You can’t expect to double your sales and your revenue with a blog post. However, if you are consistent and respect your readers you can expect excellent results. The reports, stats and studies are all on your side.